Designed to build on the concepts presented in the DVD, the lab activities in this set will teach your students about the physical setting of the world’s oceans and the processes affecting them. Each of the ten labs can be presented as a series of minilabs, a combination of demonstrations and labs, or as a week-long set of lab stations that may be done in any order. Topics include Tides, Surface Currents, Density Currents, Waves, Sedimentation, Sand, Turbidity Currents, Salinity, Ocean Floor Profile, Bathymetry, and Oceanography Careers. The manual also covers national standards, teaching strategies, a planning guide, pretests, and learning outcomes, as well as student worksheets. 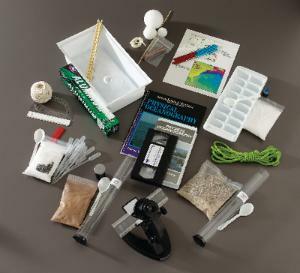 The kit includes enough materials for ten setups, a DVD, and a teacher’s guide. Duration of DVD: 19 minutes.